PRODUCT: 3 Wide X 1-1/2 inch Diameter Hard Rubber Seam Roller. 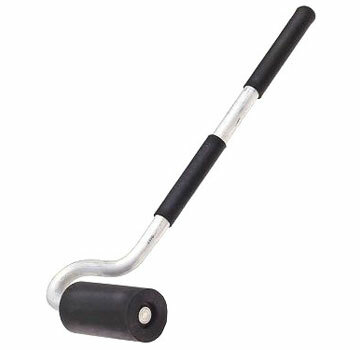 J-Roller Design with 13 inch Aluminum Handle and 2 Grips to Provide Greater Leverage When Pressing. Price/Each. Frame: Solid aluminum rod, 1/2" diameter (very durable). Roller: 3" wide x 1-1/2" diameter, hard rubber (but still with a little give). Bearing: Epoxy Composite Bushing (will take a lot of wear, but its not a ball bearing). Double Grip Handle: Each grip area is a rubber sleeve, about 3-1/4 inches long each. Overall length of the extended portion of the handle is about 11 inches. Overall Tool Length: About 13-1/8"
Balance: The overall tool has excellent balance.